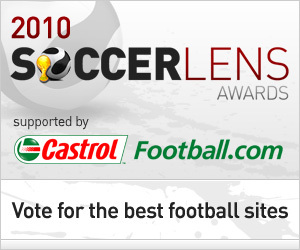 The 2010 Soccerlens Awards winners were announced yesterday, as decided exclusively through fan voting. There were some surprises, some expected wins but overall, we’re happy to see that the best and most popular websites and writers were crowned the best of 2010. Today we’ll look at the Editors’ Picks for 2010, which is essentially who the SLA panel would have voted for, as well as review the changes made to the 2010 Soccerlens Awards and plans for next year. How do you improve the #1 football awards? This year’s Awards are the answer to that question – we streamlined the award categories to make them more relevant to the current state of the industry, we also moved the Awards to their own home and brought in sponsors to help us have the funding to reach out to a mass audience. The move was a resounding success – with nearly 38,000 votes cast, the 2010 edition is the most popular SLAs yet, thanks largely to the efforts of the nominees in promoting the awards through Twitter, Facebook and their own websites. Most importantly however, the cornerstone of the 2010 SLAs has been in giving publishers a voice and a chance to tell their story through the Nominees interviews. Keeping with the Soccerlens tradition of giving football fans a voice and a chance to tell their story, we feel that the Soccerlens Awards should not only stand for the best in football but also give football bloggers an outlet to share their success stories. Without the excellent writers and websites shortlisted in this year’s Awards (and indeed, the hundreds of nominees who didn’t make the final cut), the football fan’s online experience would be that much poorer. We’re privileged to be able to cover, talk to and read such great sites and writers. The Best Football Website award considers those websites who would be the #1 source of football news for football fans. In other words, if there was only one football website you were allowed access to, who would you pick? Our shortlisted candidates were all websites that aimed to take that #1 spot in the lives of football fans. When it comes to comprehensive football news coverage, entertaining fans with quality football writing, being the first to break news, being a reliable source of insider gossip and being the first port of call for many a football fan, the Guardian Football website edges out the rest of the competition. They’re bloody good, and while they have their flaws, they are still the industry standard in football news. See voting results on the Best Football Website page. The Best New Football Website award recognises that outstanding performer who, despite only launching in the past year, has made an instant impact on the online football community. And when it comes to making a splash, Zonal Marking has been the outstanding candidate for 2010 (quite similar to how good Football Ramble were last year). Whether tactical analysis of football matches is your idea of fun or not, it’s hard to argue against ZM’s popularity and more importantly, their ability to provide a fresh perspective on watching football and making football tactics easy to digest for the common football fan. Read the Zonal Marking interview. 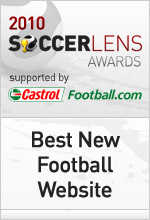 See voting results on the Best New Football Website page. The drama of football can be too much even for the most hardened of us, but those in this category do their part to keep us entertained through the highs and lows of a long season. The outstanding candidates in this category including the Studs Up comic, the excellent Dirty Tackle blog and the brilliant Run of Play. In the end it came down to sheer entertainment value and dedication to entertaining the readers, and Kickette not only ticks all the boxes, their community is a source of constant entertainment as well. And yes, guys read Kickette too, and not just for the photos. Well written and consistently humourous, Kickette is our pick for the most entertaining football site of 2010. See voting results on the Most Entertaining Football Website page. This year the Best Football Gear Website award recognises all quality websites dedicated to gear, whether they sell products or write comprehensive reviews. We all have our favourites when it comes to buying football gear online and there are many sites that give us leaks and reviews of the latest football shirts, but when it comes to football boots, there’s only one site head and shoulders ahead of everyone else. For their comprehensive product reviews and their all-round excellence, Footy Boots is the editors’ pick for the best football gear site of 2010. Read the Footy Boots interview. 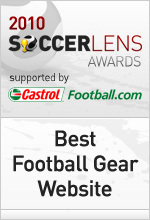 See voting results on the Best Football Gear Website page. The Best Football Videos Website category celebrates the ultimate time waster – your #1 source for football videos. Footy Tube, TV Golo, Soccer Clips and Footy Room all have their respective merits, but 101 Great Goals is still raising the high standards they set in 2006/2007. Their comprehensive coverage of football videos will take some beating, and if they keep it up we might just retire this award and give it to 101GG permanently! Read the 101 Great Goals interview. 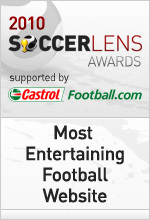 See voting results on the Best Football Videos Website page. The Best Club Fansite award celebrates those websites dedicated to a single club. It the ultimate populist vote, and this year saw Arsenal, Manchester United, Liverpool and Tottenham fans (amongst others) thrash it out for the title. Despite the presence of heavyweights such as KUMB, Republik of Mancunia and Arseblog, we’ve gone for The Tomkins Times for the insightful news coverage and analysis of all things Liverpool. No one puts it better than the Independent when they called it “perhaps the most intelligent guide to Liverpool available on the internet”. Paul has done a fantastic job, and while he may not win the populist vote, he gets ours for the best club fansite of 2010. Read The Tomkins Times interview. 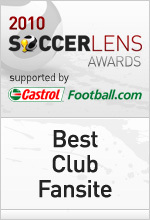 See voting results on the Best Club Fansite page. With so many quality football podcasts going around, how do you pick the best one? More than any other SLA category, the competition for this award gets better and better every year as production values and on-air talent keep improving. This is one of those cases where it’s easy to overlook the best candidate because they’ve been consistently good for so long. The Guardian Football Weekly podcast is top of the pile for a reason – they keep improving and pushing themselves to stay ahead of the competition every year, and where many shows suffer a decline, Football Weekly goes from strength to strength. We love the Two Footed Tackle podcast, but if there’s one podcast you won’t want to miss, that’s the Guardian Football Weekly. 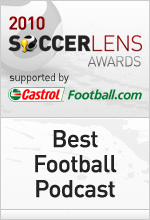 See voting results on the Best Football Podcast page. Whether they run the whole show on their own or are an invaluable part of a team, the Best Football Blogger award celebrates the blogger who stands out among all others. We’ve said this all along – every single candidate in this category deserves an award. Michael Cox for his excellent work at Zonal Marking (for which he’s won this year’s Best Football Blogger award), Adam Bader for getting the dream job for every football blogger, Brooks Peck for turning Dirty Tackle into a Yahoo-based powerhouse, Brian Phillips for his ridiculously top-notch writing on Run of Play (and elsewhere), and of course the Swiss Ramble blog. Ultimately we picked the blogger who has leveraged his considerable talents to gain access to the widest possible footballing audience. Brooks Peck stands out for being able to bring you news that you won’t see anywhere else or would read on DT first. If we could vote for all five candidates, we would, but like everyone else we can only pick one, Brooks edges ahead of his competition thanks to his ability to entertain and inform a massive football audience. Read the Dirty Tackle interview. See voting results on the Best Football Blogger page. The Best Football Journalist award recognises those journalists who have been consistently outstanding and entertaining during 2010, those who broke news most frequently and those who were able to bridge the gap between traditional journalism and new media successfully. From Marcotti to Wilson to Honigstein to Galarcep, this was a tough category to shortlist and tougher still to vote on. For us the key factor was their performances in 2010, and for that we whittled our initial shortlist down to two – Daniel Taylor for his peerless reporting and Scott Murray for his brilliant writing. Our final vote in this category goes to Scott Murray, partially because he’s so under-rated in a star-studded lineup that is the Guardian’s stable of journalists, but mostly because he is just so damn good. 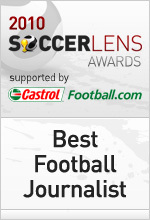 See voting results on the Best Football Journalist page. The Best Niche Website award is for those websites who endeavour to stay away from what the masses are doing and give the football world something unique. The Swiss Ramble gets our vote for shedding light on a topic that is at once both essential and alien to the modern football fan – football finance – and for doing all the hard work so that bloggers can just quote stats and conclusions and pass them off as their own. Few changes in football have impacted fans (and their support) as takeovers, football ownership and debt, and Swiss Ramble has made it easy for fans (and bloggers) to make sense of the mess their clubs find themselves in. Read the Swiss Ramble interview. See voting results on the Best Football Niche Website page. That’s a wrap for the 2010 Soccerlens Awards, it’s been a pleasure working on this project for the last 4 years and I’d like to thank everyone once again for making this year’s Awards such a fantastic success. Congratulations once again to all the winners and best of luck to everyone else for next year. Building on the success of this year’s Awards, the 2011 edition promises to be bigger and better than ever. Work has already begun on mapping out our plans for 2011, we have quite a few surprises in store for you, starting with an important announcement in January 2011. To keep track of all the latest news and updates, follow us on Twitter and Facebook.